Sandra González-Bailón is an Assistant Professor at the Annenberg School for Communication and affiliated faculty at the Warren Center for Network and Data Sciences at the University of Pennsylvania. Prior to joining Penn, she was a Research Fellow at the Oxford Internet Institute (2008-2013), where she is now a Research Associate. She completed her doctoral degree in Nuffield College (University of Oxford) and her undergraduate studies at the University of Barcelona. 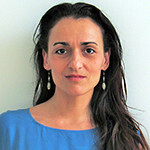 Sandra’s research lies at the intersection of network science, data mining, computational tools, and political communication. She is currently working on the book Decoding the Social World. When Data Science meets Communication (forthcoming with MIT Press) and co-editing The Oxford Handbook of Communication in the Networked Age (with Brooke Foucault-Welles, forthcoming with Oxford University Press). More information about her research and publications can be found at her group’s website <dimenet.asc.upenn.edu>.